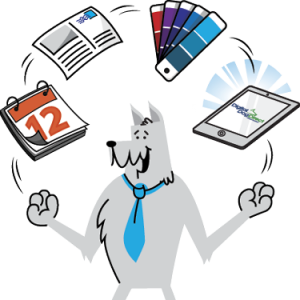 Digital Dog Direct can handle nearly every aspect of your direct mail and marketing campaigns all under one roof! We provide a full range of printing, mailing, and marketing services to execute a successful direct marketing strategy. Our customers enjoy a comfortable one-stop-shopping experience. It’s of the upmost importance to us that our clients’ expectations are exceeded in quality and service, so we take special care to ensure complete customer satisfaction time after time. Because of our efforts, clients consistently rate their overall experience and customer service 4.75 stars (out of 5). We’re experienced prospect-mailing-list-acquisition experts who identify smart ways to deploy data. Combining specialized data processing with variable data printing, we can help you personalize your messages to specific recipients that increase response and reduce waste. We offer quick turnaround times for printing, processing and mailing your direct mail marketing pieces — including same-day service for many projects! Our Direct Delivery Discount Postal Analysis service can cut your postage costs significantly and help you reach your customers more efficiently. We also eliminate waste through expert database scrubbing and address-correction services. Launched as SHM Mailers over 40 years ago, our services and capabilities have expanded to meet our customers’ evolving needs and challenges. Now as Digital Dog Direct, located in new, modern facilities with state-of-the-art equipment, our dedicated team includes some of the best experts in the business — and we will work with you at every stage of the process to ensure that your mailing is completed in the best, most cost-effective and fastest way possible. Digital Dog Direct has been recognized by IDEAlliance, the trade association of print and electronic media providers, for our high standards of printing excellence. Our G7 Master Qualification distinguishes Digital Dog Direct as a printing company that produces color printing of the best quality and that achieves international color-consistency standards for print media. For our clients, this means that we can keep your colors as consistent as possible across all of your printed material—even with very small quantities. Your brand is safe with us, and with Digital Dog Direct you can be more confident that it will look the way it should no matter what media type you select for printing. G7 stands for gray, the G part, and 7 for the 4 inks (cyan, magenta, yellow and black) that are used in printing and the resulting 3 overprint colors (red, green, and blue). These are a few of the reasons marketing agencies of all sizes trust us as their partner. Are you an agency? Find out more.